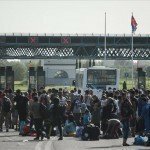 Budapest, September 16 (MTI) – An aggressive crowd of illegal migrants gathering on the Serbian side of the Hungarian border at the Röszke crossing station broke down the gate and attempted to cross into Hungary on Wednesday afternoon. According to a statement on the national police’s website, the gate was immediately replaced by a multiple line formed by police, while the angry crowd threw stones and bottles at the officers. 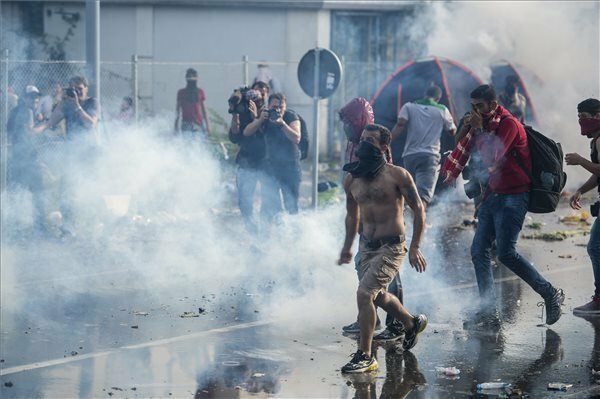 The police used tear gas at the Horgos crossing point where a small group of migrants attempted to push through the border gate shouting “open up!” in the early afternoon. The police also deployed water-cannons and helicopters in the area. The crowd, gathering on the Serbian side and numbering several hundred people, forced open the gate and attempted to push through, and threw stones, bottles, and burning torches at the police officers. MTI’s on-site correspondent said that the migrants had “besieged” one of the crossing points at the facility. 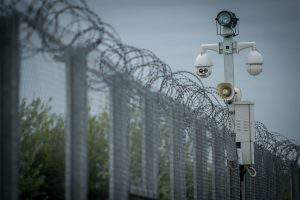 MTI’s correspondent saw thousands of migrants, including women and children, setting up a camp along the road to the crossing point, and reported further groups of migrants approaching the Hungarian border. The Serbian authorities have not intervened. Thank you, Hungarian Brothers, for defending our continent – you are the best example for the rest of Europe. I wish you all the best in this battle and God bless you! I can’t believe that Germany want these terrorists, YES THEY ARE ALL TERRORISTS!!!!!! This proves one thing: Angela Merkel is A STUPID IDIOT. They want to get into Europe and this is their behaviour. Think what they will be like with their demands if they do get in. 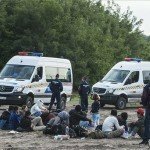 Hungary the small country with the great heart – keeping Europe safe while the rest of them just sit and do nothing. Well done Mr Orban. 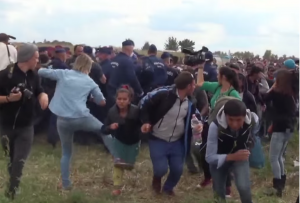 Thank you Viktor Orban and great magyar people for defending our borders against these people. They are certainly not refugees! They behave like wild animals or IS-terrorists. We already have far to many of them in Sweden. Full support from Slovakia, against these hordes of bastards showing strong disrespect to our laws, rules and values! 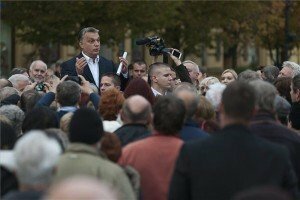 When I came to Hungary I had to provide documents that I was allowed to be there. When I stayed I had to work so that I qualified for any kind of aid. I still don’t get “aid”. I get what is owed me as part of the social contract. I’m a proud hungarian living in Denmark and I’m outraged to see what is going on in my birthcountry at this moment with these uncivilized muslim madmen. Even though I’m a woman, I would be proud to stand shoulder to shoulder against the hordes with my fellow European Citizens to protect our way of life. Thank you, hungarian brothers and sisters, for defending our continent against the hordes of Islam, while most of Europe are in submission mode. I live in New Zealand and our government is under pressure to accept more and more of these so-called “poor refugees” with the media portraying sad scenes of women and children. 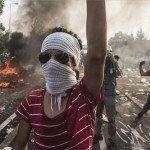 Thank you for showing the rest of the world what these protesters and illegal migrants are really like, and what sort of demanding behaviour we can expect when they come here. 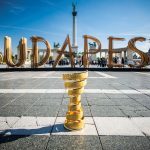 Stand fast Hungary, the rest of the world is relying on you and thanks for the pictures. I am from Serbia and i support your fight against muslim terrorists.. save the europe, we are f.cked but you still can secced! Thank you hungarian brothers. We need your leadership in Europe !!! Polish people are gonna be always by your side. many thx and wish you luck. we have lots of those fuckers here and they are destroying all of sweden!!! Thank you hungarian brothers. Europe needs your leadership!!! Polish people are gonna be always by your side. We are proud of you. many thx and wish you luck. Thank you great Magyar Brothers for defending our native continent!!! It is our only home.